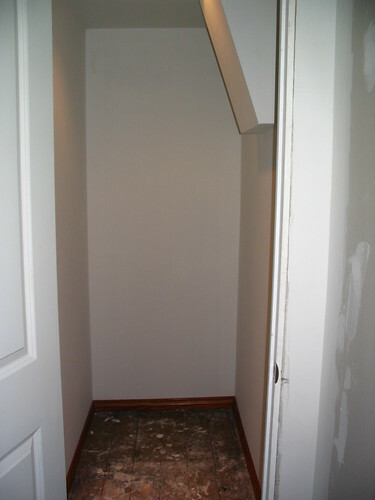 Fixer-Upper » Adding a closet – our best idea EVER. Adding a closet – our best idea EVER. When we gutted a third of our upstairs in order to remodel the bathroom, we had a golden opportunity. Restructuring this area of the house meant we could put the walls wherever we wanted. So we made the bathroom about 4′ wider, and used the leftover space to make a closet. All old houses lack storage space, unless they’ve been through a miraculous remodel. Apparently, the Victorians just didn’t collect the same amount of total crap we do today. They probably didn’t feel the need to own 22 pairs of black dress shoes. How ever did they get by? Adding the closet was not difficult. It’s a bit of framing and a lot of drywall, but if you have an empty spot somewhere in your house that is going to waste, it’s a doable DIY job. We even got fancy and added an overhead recessed light (oooooh) and trim. Yup, trim. Why trim out a closet that no one will ever see? 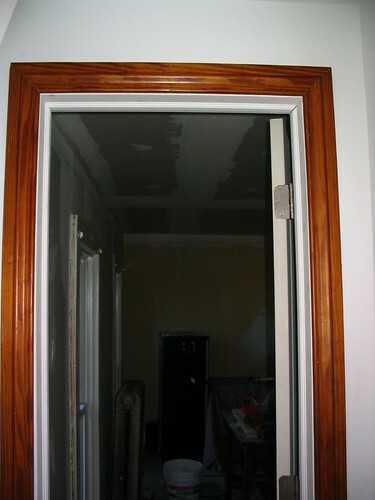 Well, partly because trim makes a HUGE difference in how a room feels. But also because we had leftovers from a pile of salvage trim we bought about a year ago – just enough to do the interior of this little closet. The trim will get a coat of white paint to match the rest of the house. And someday, the floor in there will get addressed. But the walls were primed, so as soon as the paint dried I filled it up. And every day, I am thankful because I no longer have to look at a big pile of junk in our bedroom. Not ready to tackle a full build? IKEA has some really affordable storage systems (like the Leksvik and Hemnes) that would do the job. You still need to screw things together, but you can handle that! I’m always amazed at the number of closets in my house. As you said, they are rare in older homes. I have two downstairs, and three upstairs, including one cool walk-in closet that is shared by two rooms. And I applaud you for adding the trim. it’s too easy to over look it and skip it, but it makes a difference. Are you sure you want to paint that trim? It looks so nice with natural colours!